That's a whole lot of metal. This week, preorders opened up for a career-encompassing box set by Norwegian black-metal pioneers Emperor. 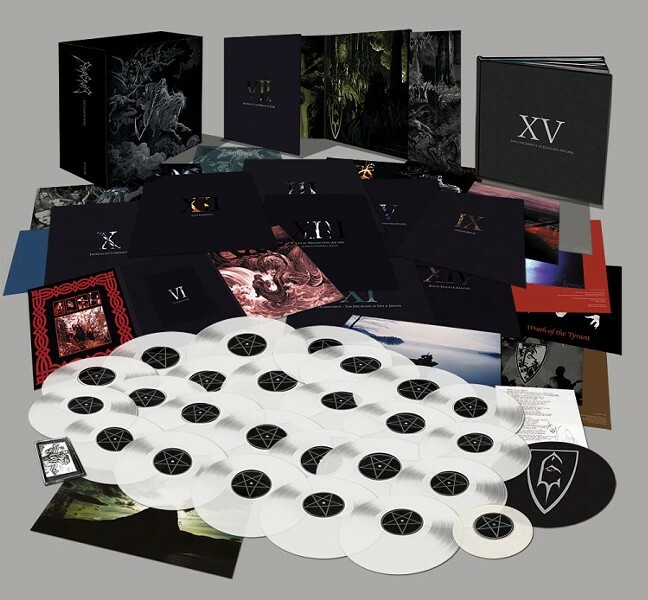 Released by Finnish label Blood Music, this massive collection is among the biggest box sets ever made, and for just under $800, all 24 of its LPs can be yours. Copies are going fast, so take note, black-metal completists with plenty of disposable income: this set compiles pretty much everything Emperor recorded in their 23-year run, including all their studio albums, demos, outtakes, and covers, as well as multiple concerts. You also get a bunch of books and posters. Emperor formed in 1991, as part of the same scene that spawned black metal's "big three"—Burzum, Mayhem, and Darkthrone. But instead of relying on lo-fi, high-end harshness to create their satanic uproar, they created massive, sweeping soundscapes with an almost symphonic edge, fleshing out their frenzied sound with huge synth-string flourishes and sprawling, progressive arrangements. Today's 12 O'Clock Track is "I Am the Black Wizards" off the band's first LP, 1994's absolutely brutal In the Nightside Eclipse. It's one of the band's most iconic songs, and it smashes together breakneck speeds, punishing heaviness, and satanic worship. Check it out below.